Masonry fireplaces can have a variety of looks from contemporary to traditional. Your fireplace doors should reflect that style and the style of your home. Design Specialties offers the widest variety of doors in the widest design styles. Choose the clean, sleek lines of the Moderne for a contemporary look. The Brookfield and Carolina doors are popular design options that work with a variety of styles. The Hammered Edge door features a traditional look that shows the "Old World" craftsmanship that goes into every door. Our almost unlimited finish and design options allow you to design a fireplace door that shows your style. A factory built fireplace often comes with flimsy, basic doors and can have lots of exposed black metal around the opening. Our fireplace doors and screens are specifically made to work with your fireplace while adding a new level of style. Choose from a wide variety of options which upgrades the look of your fireplace by replacing the doors and vents. 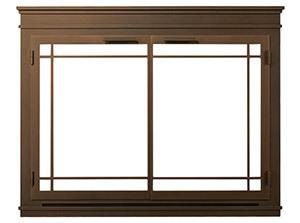 Our screens add safety and style to your gas fireplace. No matter what type of factory built fireplace you have, we can create the door or screen that will make your fireplace look amazing. The Fireplace Shop and Grill Center at West Sport in Sudbury, MA offers everything hearth, grill and outdoor living related for your home including Majestic DV Gas Fireplace, Peterson Direct Vent Gas Fireplace Inserts, Hearthstone Wood Burning Fireplace Inserts and Gas Log Sets. West Sport glass fireplace doors have been installed in Framingham, Natick, Lexington, Newton, Wellesley, and other towns in Massachusetts.